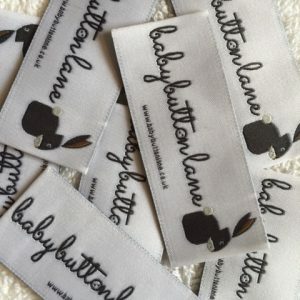 We are your one-stop labels supplier; we produce high quality personalized fabric labels for garment designers, tailors, dressmakers, quilters and knitters; you can have your designer brand label in any colour, size, shape and quality. One particular designer customer described the inspiration he got from creating his collection is all about local cultural and architectural influences. And it is a sort of balance between the feminine and masculine; and contemporary and traditional design. Our custom-made clothing labels work perfectly with designer collections; we use very fine threads to create a precise, refined, delicate & detailed weaving image; we have available stock of more than 600 colour threads to choose and create the vivid colour on woven clothing labels. We are capable to create any colour, size and shape of clothing woven labels. We design perfect personalized fabric, brand labels that are aesthetic to reflect designer’s signature. The digital high density weaving on woven clothing labels makes the designer brand labels truly proud to share and stand behind. Contact us today, our contact details are here; we will help to custom labels for your custom clothing labels, personalized fabric Labels, and tags. Perfect Labels Lanyards is one of the leading UK Labels Suppliers devoted to promoting the fashion woven clothing labels for more than 16 years. We work closely with many London designers, and we put ourselves in a constant stage of renewal and development in sew in woven labels design concept and new label materials. Sew in woven labels are a great way to add a professional touch to designer clothes, as well as handmade products. Our woven clothing labels are used by leading London designer brands of womenswear, menswear, new luxury street trends, and many special projects presented by important international designers. As professional clothing labels maker, we cultivate a mutual relationship with London clothes designers, and we invest our resources that directly connects the growth and development of designer products makers. Labels for scarves are very important. A poor quality label can tell you straight away if the silk scarf you are looking at is genuine or fake. Our custom-made scarves labels are beautiful in its weaving design, soft to touch, and available in a wide range of vivid colours option. Woven cushion labels are ideal way to brand the excellence of the cushion makers of the new classics with the high-quality of their exclusive handmade products to the cutting-edge accessories that are playing an ever more important role in the cushions market, which have redefined the Made-in-England cushions. We create a fashion and contemporary style of woven cushion labels that will give your products a unique signature seal of approval. We offer fabric labels and leather labels for hand-made designer bags. Our leather labels are genuine leather, using a unique pressing print technique, high-quality tanned leather that improves with use and ages beautifully. Contact us today, our contact details are here; we will help to custom your brand labels.